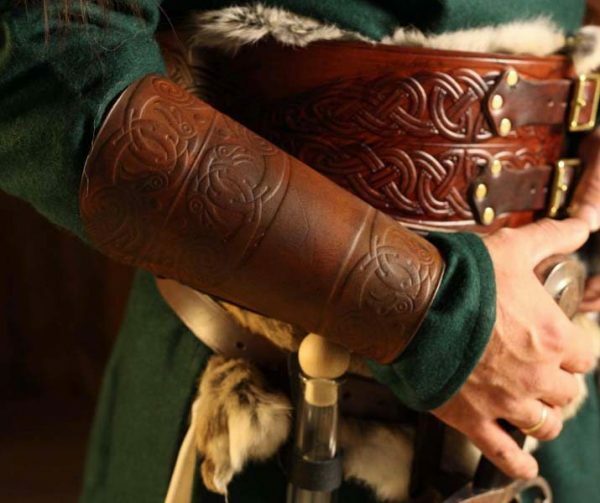 The Huginn and Muninn LARP Leather Vambraces?are a simple but elegant?design of armguard, offered by Black Raven Armoury , they have been professionally dyed and built for you by ourselves. Created & designed by Alex Agricola, the whole set is made of premium grade top grain 3.2-3.5 mm Veg Tanned leather. 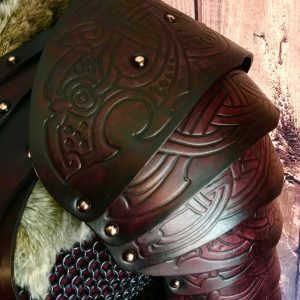 This armour is 100% suitable for a variety of uses, be it Larp event, theatre stage or big screen, this kit will enable you to produce a set of fully functional ?REAL? 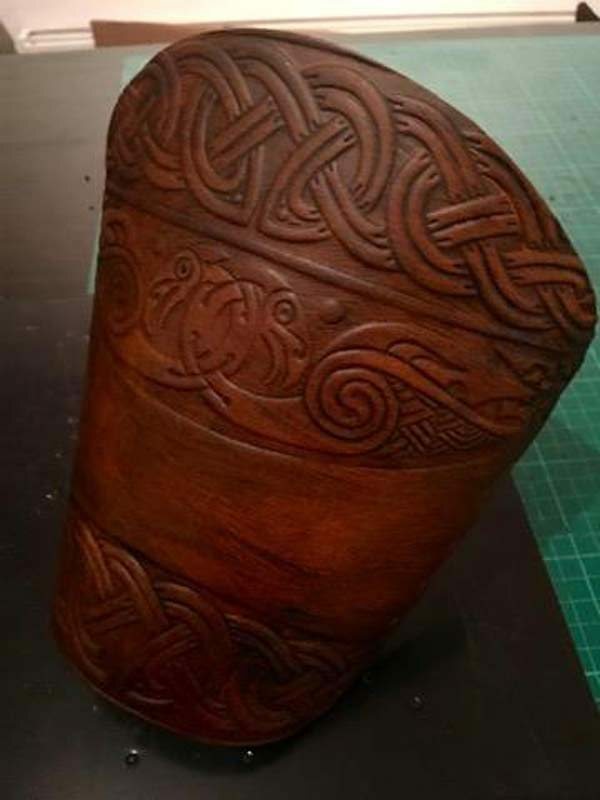 protective armour, however If you require a thicker leather version of this leather armour kit, suitable for SCA or heavy weight Larp systems please contact us for details. 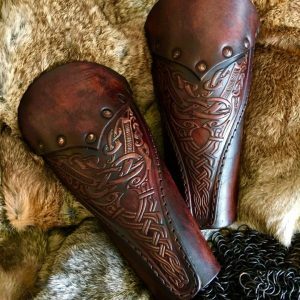 The Huginn and Muninn LARP Leather Vambraces are a simple but elegant armguard, designed and offered by Black Raven Armoury. Designed, cut, assembled and finished by Black Raven Armoury’s own Alex Agricola, these functional gauntlets are made of premium grade top grain 3.2-3.5 mm Veg Tanned leather. 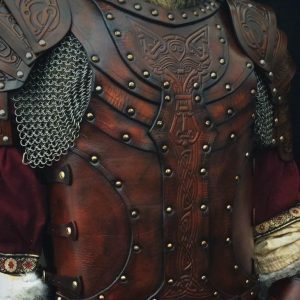 This armour is 100% suitable for a variety of uses, Larp events, cosplay, renaissance faire or theatre, stage or big screen productions. 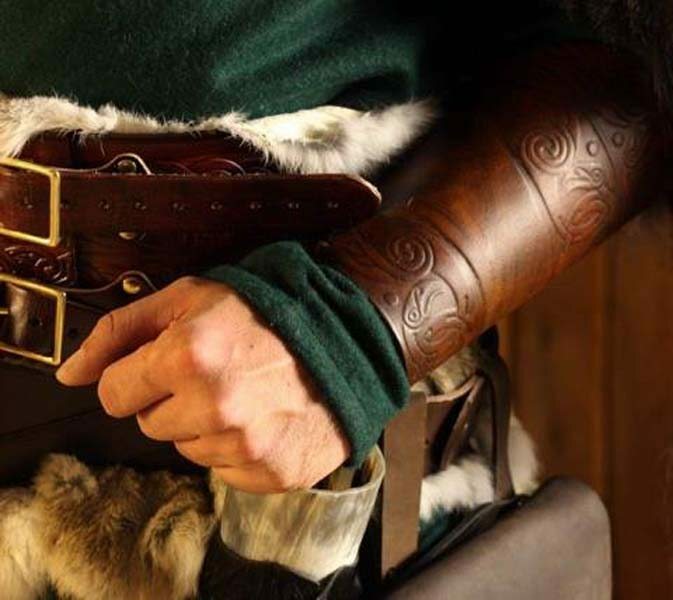 If you require a thicker leather version of this leather armour kit, suitable for SCA or heavy weight Larp systems please contact us for details. ?I’m telling you… he rode with the Bruce… Right through Briarwood. He had arms like tree trunks that one and Vambraces that could turn a claymore…? All armours come ready built and finished in the colour of your choice, apart from the un-dyed natural version which is left for you to stain and finish, in your own choice of colour. Great product as always, sturdy but with give so it doesn’t restrict your movement. Came with extra cord but with how thick they are (not in a negative way) it will have long life before they wear to have to replace with the spares. Amazing quality especially for how cheap in price the product is.